The start of the season begins with activities for all ages. The unofficial start to summer kicks off this weekend, and Surf & Stream Campground has a full lineup of activities planned to celebrate. Along with the many events taking place around the shore, guests are invited to participate in various attractions at the campground. After settling in on Friday, May 27th, visitors can enjoy a film during Drive-In Movie Night beginning at 8:00 pm. 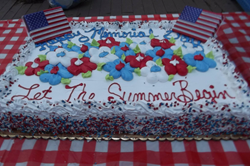 Young campers can look forward to Kid’s Crafts on Saturday morning at 11:00 am before the fun continues at the annual Memorial Day Barbecue at 6:00 pm. The evening will include food, music, and an appearance from Elvis! Early risers are welcome to feast on a pancake breakfast on Sunday at 9:00 am followed by pony rides at 11:00 am. The weekend concludes with Bingo and another round of DJ Joe at 4:00 pm. Visit Surf & Stream Campground’s website for changes or updates to the schedule at http://surfnstream.com/.